I just wanted to take the time to thank those who have purchased merchandise from the STBR Shop on CafePress. 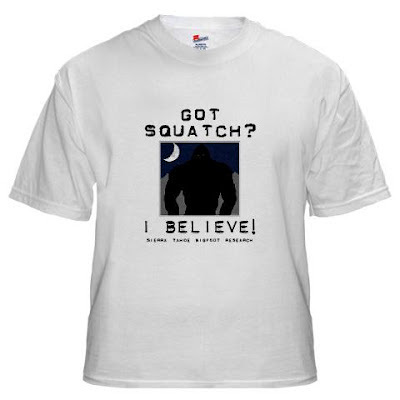 I'd love it if any of those who have purchased something would send me a picture of yourself, modeling your FEELING SQUATCHY and I BELIEVE wares. This Thursday, June 28, 2012 at 9pm A&E's reality show, Cajun Justice will feature a story on deputies going out to investigate a sighting report of the legendary Rougarou, the local name for a "shape-shifting swamp monster." Supoosedly the witness captured video of the creature on his cell phone that made the deputies want to investigate further. The Episode title is A Real Drag. See the details and a clip by CLICKING HERE. Chuck Prahl from the Bigfoot Tonight Show has a new site started. Please go check it out for more news and info. A fellow sasquatch enthusiast, Barry, contacted me a few months back, and we traded some ideas back and forth in regards to him wanting to take a trip up to the Sierras to do some scouting around. He was gracious enough to share some pictures for us to enjoy of a couple trips he took over the past few weeks. Though he didn't have any interaction, he did come across an interesting tree break that he didn't notice until he got home. Below is a great game cam picture, where he captured a picture of a coyote, but also on the right side of the photo, there is a small pine tree with the top snapped and hanging down. It is a rather sharp break that could be explained as snow load, but because of the nature of the clean break, I think it could have been snapped by other means. Nonetheless, it is a great photo. The previous weekend of May 26th, Barry and his fiance Jen, took their dogs out to an area near the San Joaquin River. There was snow coming down one day, and Spring sunshine the next, showing the power of mother nature, especially in the Sierras. This just drives home the point, that when venturing out, you should always be prepared for extremes in weather. I want to thank Barry and Jen for sharing their pictures with us. I'm always glad to show off the beauty, and the sheer squatchiness of the Sierra Nevada Mountains. My buddy Woodrat has been taking his daughter, "Lizard" squatching since she was a baby. Now she's getting ready to graduate 1st grade, and loves getting out in the woods and mountains with her dad, more than anything. Woodrat doesn't get far off the beaten path with her. He keeps it within her limitations. You don't need to get far off road to get near the bigfoot. Most sightings occur as they cross a road, right?